Vehicle history expert CARTELL.IE report today (January 28th) that the age of the private fleet in Ireland has levelled off significantly for the first time in over 10 years. The age of the private fleet now stands at 8.83 years. Cartell.ie tracked the average age of a private vehicle in Ireland in January of every year between 2000 and 2015. 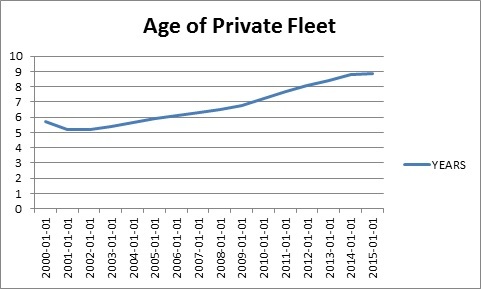 The difference between the age of the fleet in January 2014 and January 2015 (11 days) is the lowest increase recorded since 2001 and is a clear indicator that the age of the private fleet in Ireland may have levelled off. To put perspective on the figure of 11 days it should be noted that, as recently as January 2011, the age of fleet recorded a 168-day-increase year-on-year. The news that the age of fleet has levelled off is a further sign that the vehicle industry is returning to normality. The result may have been sparked by a combination of events: new car sales are advancing after years of lost ground; and owners of older vehicles in the fleet may have held them for as long as possible before now up-cycling. The age of the whole Irish fleet, not simply private vehicle’s, now stands at 9.39 years.